Hide deals from seller "The Genuine Article"
No limit per person. Valid on a 2-hour basic bead or basic wire jewelry class. Includes $8 materials kit to use in class. Must be at least 13 years old. See website or call for class schedule. By appointment only. Promotional value expires 365 days after purchase. 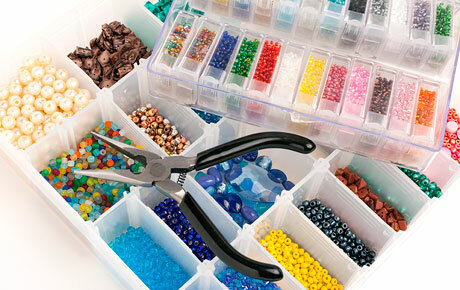 Get creative with this deal for 50% off a 2-hour jewelry-making class from The Genuine Article in Wheaton ($48 value). Select either a basic bead or basic wire class and learn how to make fabulous, unique jewelry. The Genuine Article is a jewelry studio, workshop and gallery that also sells an impressive variety of beads, stones and stringing materials. Shop owner Betty has more than 30 years of experience as an artist, artisan and instructor. She opened The Genuine Article six years ago to share her passion for art and her expertise in jewelry-making. In the basic wire-working class, you will use what you learn to make two pairs of earrings. The basic bead class will show you the proper tools and techniques for creating a bracelet or necklace, and you will make a bracelet in the class. Nurture your creative side with this colorful deal. A jewelry studio, gallery, workshop and bead store in Wheaton.